'Auntie Mame' is a comedy movie made in 1958, directed by Morton DaCosta and starring Rosalind Russell in the title role.The movie was based on the 1955 novel by Patrick Dennis and the subsequent Broadway play in which Russell also starred and which Morton DaCosta directed. The play ran for over 600 performances at the Broadhurst Theater between 1956 and 1958. The original sharp and witty Broadway script by Lawrence and Lee needed very little change and was adapted for the screen by Betty Comden and Adolph Green. The film received six Academy Award nominations including Best Picture, Best Actress (Rosalind Russell), and Best Supporting Actress (Peggy Cass), but won no Oscars. It lost the Best Picture Award to to Vincente Minnelli's spectacular musical 'Gigi'. Commercially it was a great success. It became the highest grossing movie of the year and helped turn around the fortunes of Warner Brothers, who in 1958 had been in dire financial straits owing to a series of movie flops. The film became the highest grossing movie of 1958 and its net profit of $3.4 million made a significant contribution to the studio's return to the black in 1959. During the Great Depression of the 1930's an orphan, Patrick Dennis, goes to live with his father's sister Mame Dennis, played by Rosalind Russell. Mame is an eccentric, flamboyant woman with an unconventional, bohemian lifestyle. She takes the boy under her wing, always making sure he tries to live life to the fullest. Patrick grows up with many extraordinary and often hilarious adventures, but conflicts arise with the trustee of his father''s will, strait-laced banker, Mr. Dwight Babcock, played by Fred Clark. 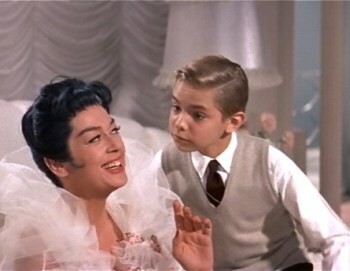 The film shows Patrick and his aunt over the course of about 20 years through a series of episodes as Mame teaches her nephew to "Live, live, live". She survives losing her money in the Depression, finds a wealthy husband, Beauregard, played by Forrest Tucker, and never loses her zest for life. There is much scope for comedy and it is exploited to the full by the wonderful cast and witty screenplay. Although Rosalind Russell had been a great success in the lead role of Mame on Broadway from 1956 to 1958, Warner Brothers also considered Eve Arden for the role after she had wowed audiences in a West coast run of the play. The fact that Russell had a large investment in the show tilted the balance in her favor. Vivian Vance (Ethel Mertz on 'I Love Lucy') was considered for the part of Vera Charles, Mame's alcohol loving best friend, but the part was eventually given to Australian actress Coral Browne who had made a name for herself on the London stage. Director Morton DaCosta brought two other Broadway cast members for the screen. Jan Handzlik plays Patrick Dennis as a child and Peggy Cass plays mousy secretary Agnes Gooch. At the end of each scene chief Warner Brothers electrician, Frank Flanagan, created a series of theater style fade outs whereby each time the stage was blacked out so that only Russell's face could be seen. The technique became known as the "Flanagan fade". The system made clear when a sequence ended, and also made sure that Rosalind Russell continued to be the focus of attention. The success of the film spawned a Broadway musical version of the story in 1966 called 'Mame', starring Angela Lansbury. It was a great success but a subsequent movie musical in 1974 starring Lucille Ball, fared badly at the box office. Rosalind Russell (1907-1976) This is Rosalind Russell's film from first to last, and her performance is magnificent and Oscar-worthy. (She was nominated for the Best Actress Award but lost to Susan Hayward who won the Award for 'I Want to Live!'' ) Her performance displays a clever mixing of Mame's eccentricity and essential decency and compassion. The role revived her career which had stalled after her successes of the 1930's and 1940's. She became for the rest of her life almost synonymous with the role of Mame. Forrest Tucker(1919-1986) After making his name in westerns and science fiction films Forest Tucker showed a real flair for comedy as Mame's first husband. In his later career he became well known on television, his most famous role being Sgt. Morgan O'Rourke in 'F Troop' in the mid 1960's. Peggy Cass(1924-99) Nominated for a Best Supporting Actress Oscar in this, her best known movie performance, Peggy Cass makes good use of her scenes as the myopic Agnes Gooch. She later became a well known face on television appearing regularly on panel games such as 'To Tell The Truth'. Coral Browne (1913-91) is brilliant as Mame''s old friend, Vera Charles. Born in Melbourne, she made her acting reputation in London's West End. Her second husband was Vincent Price whom she married in 1974. Cinematography ... Harry Stradling Sr.
Production Company ... Warner Bros.
Best Picture ... Warner Bros.
Cinematography (Color) ... Harry Stradling Sr.